I don’t want to say it, I really don’t. But I can tell no lie; Ezekiel Elliot is a stud. The Ohio State sophomore has rushed for 1632 yards and 14 touchdowns this year and might be the best running back the Ducks have seen to date. Containing the running game could be Oregon’s biggest challenge in the national title game, but if this season is any indication, the Ducks are up to the challenge. As Oregon heats up, so does Elliot and the Buckeyes. Over the last two games, against Wisconsin and Alabama respectfully, Elliot has rushed for 450 yards and four touchdowns and Ohio State has scored 101 points. He has been the spark the Buckeyes needed to help take the pressure off third string quarterback, Cardale Jones. With an effective rushing attack, the Buckeyes have controlled the pace of their games and limited Jones’ opportunities for mistakes. But the Ducks have faced a similar game plan before and will look to neutralize Elliot and make the quarterback beat them. 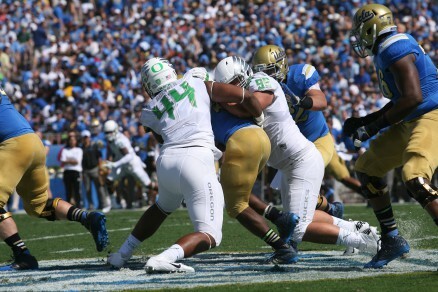 DeForest Buckner and the Ducks defense slowed the UCLA offense early. Earlier this season, Oregon faced off against UCLA and the eventual Pac-12 leading rusher, Paul Perkins. Just one week removed from their only loss of the year, the Ducks went into Pasadena and controlled the entire game proving the Ducks dominate when they dictate the pace of the game and force the opponent to be one-dimensional. They slowed Perkins down early, and with the help of key defensive stops and turnovers, the underrated Oregon defense gave the offense enough possessions to grab an early lead. And because UCLA trailed early, they had to throw more to try to comeback, which is exactly what the Ducks want you to do. In that game, Perkins rushed for a season-high 187 yards against the Ducks. However, it was mostly irrelevant due to Oregon’s 42-10 lead to start the 4th quarter. Brett Hundley was tasked with the difficult job of beating Oregon through the air, throwing 37 times for only 216 yards and two late touchdowns. The Ducks won 42-30, but it was never that close. Against the “tough” SEC defense of Alabama, Elliot ran for 230 yards and two scores on only 20 carries, including the game sealing 85 yard touchdown run late in the fourth quarter. The Crimson Tide had a 21-6 lead in the second quarter, but gave up 28 straight points to fall behind 34-21 and eventually lose the game. Alabama’s inability to stop Elliot and Jones running the ball, get off the field on third down (Ohio State converted 10-18 attempts), and move the ball consistently on offense all contributed to the loss. Alabama quarterback, Blake Sims, threw three interceptions and Alabama converted only 2 third downs all game; add all that up and that’s a recipe for disaster. 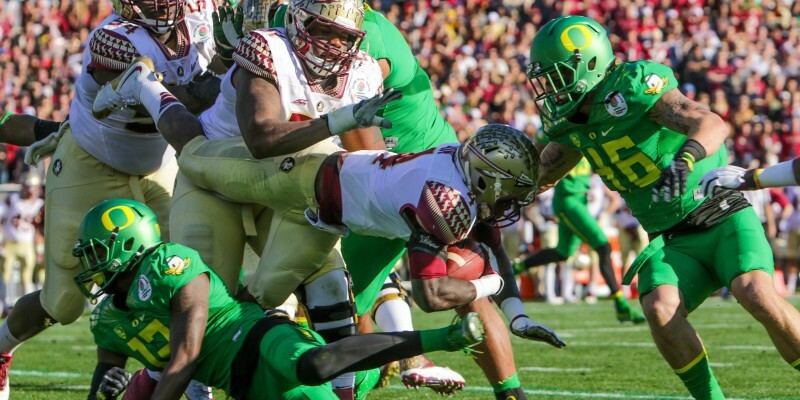 Oregon’s defense slowed FSU run game, leaving Jameis Winston chasing the Ducks on the scoreboard. Elliot has rushed for at least 220 yards in both of Jones’ starts, which has undoubtedly taken the pressure off the first-time starting quarterback. The Ducks will need to stop Elliot and Jones in the run game, as the two combined for 37 rush attempts and 273 yards against Alabama in the Sugar Bowl, if they want to take home the program’s first national championship. And Oregon has the talent, and the scheme, to do just that. Oregon’s game plan should be simple; get a lead and make Ohio State and Jones beat you through the air. The 59 points scored in the Rose Bowl got the headlines, but it was the improved play of the defense that earned the win. The defense forced five turnovers and made Florida State play catch-up, a difficult task for any team playing the Ducks. If the Ducks get a 21-6 lead like Alabama, they likely won’t lose. Oregon and Marcus Mariota won’t turn the ball over three times, the Ducks offense will convert third downs and keep drives alive, and they will make Jones’ arm beat them. That’s their formula for success. Look for Oregon to attack the Ohio State run game early, and steal drives to grab an early lead. The Ducks defense is far better than people give them credit for, and come Monday, we will see just how good the defense can be.